SkyZone has been my favorite facility so far, and that might simply be because it’s designed more for adults. But, they also have toddler time which allows parents to use all of the facilities on their own without the normal crowd or rowdiness. 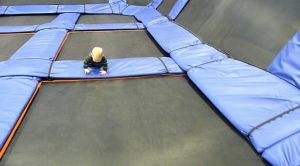 Skyzone is a trampoline park that allows children of walking age and above to jump and run around. Younger children just beginning to walk benefit by improving their balance and learning to walk over uneven surfaces. And, of course, older kids get to have fun while being active and enjoy the unique atmosphere. Of course we’ve all seen the full sized trampolines in the backyards of neighbors or friends, but for those without the money, or the land, to dedicate to the full sized version, there are other options. 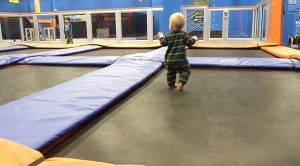 For infants (within the right weight limits, of course), there is the ‘jumper’ to accommodate the fun motion of jumping, falling, and otherwise having a relatively wider range of motion. 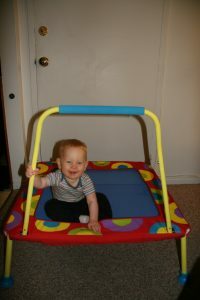 The next step is a kid’s trampoline–very similar in size to an adults mini-trampoline, commonly used for exercise and aerobics, but with a support bar they can hold on to while they jump.